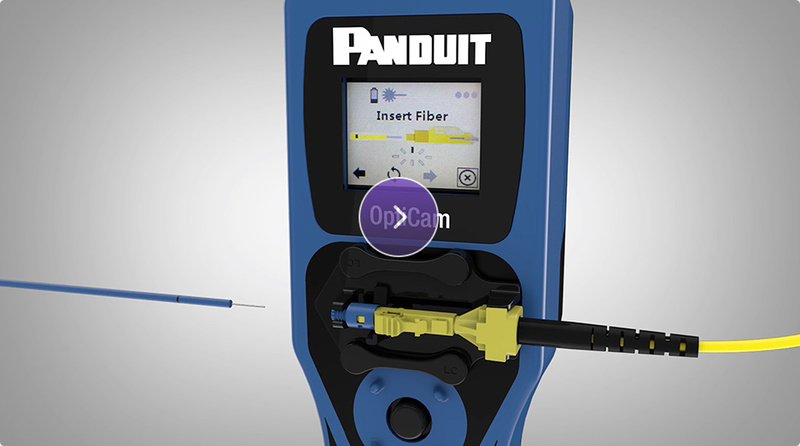 Panduit simple Fibre Cabling Termination with OptiCam 2 saves time and improves results! The OptiCam 2 fibre termination tool, offering simple to use, ‘right-first-time’ termination together with an instantly calculated and accurate insertion loss value. This new tool will provide installers with a fast and reliable fibre termination system which improves productivity by reducing install time and scrap, as well as decreasing cable re-work. The OptiCam 2 provides the installer a step by step visual guide, using a large LCD screen to display clear information. It also offers right or left-handed termination in both handheld and bench top set-up to improve usability. The tool offers a companion mobile app, which mirrors the tool’s display screen whilst it collects predefined data sets, such as user name, client ID, sequential connector numbering with time/date stamp and insertion loss values. This data can be used by project managers for client project documentation.